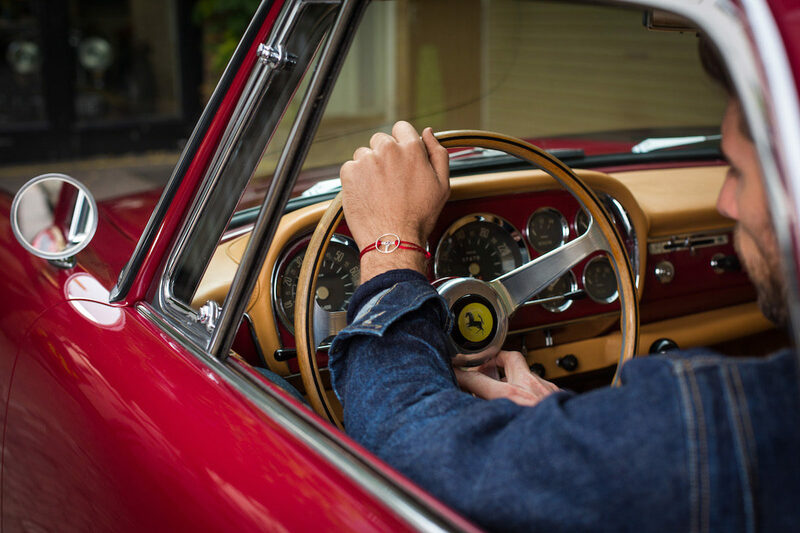 The coolest automotive accessories brand, The Mechanists, has released a set of bracelets that pay tribute to the most famous race in the world, 24h Le Mans. Dark blue denim jacket and Dark blue Japanese Selvedge Jeans, The Workers Club; Navvy merino roll neck, Anderson & Sheppard; Burgundy Utah & Delapré Galway boots with dainite soles, Edwards Green; 24H Le Mans edition bracelet on red cord, The Mechanist; Harvey Tortoiseshell Sunglasses; Kirk Original. Born from an intense and long-existing love for all things with wheels, The Mechanists is an automotive lifestyle accessories brand founded by Hedi Sersoub. 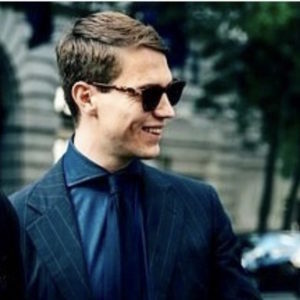 We’ve worked with Hedi before, and uniting his passion for classic cars with The Rake’s penchant for men’s style is enough to rev anyone’s engine. So, when a second opportunity arose, we sought out the expertise and garage of Sports Classics London, one of London’s foremost classic car dealerships that’s hidden away in South Kensington in a delightful mews that was once frequented by Francis Bacon. Founded by Paul Giovanni and Jonathan Kaiser, the duo have amassed what is quite frankly an absolute ridiculous fleet of classic cars. Keen to showcase their beloved wheels, they granted us permission to shoot with two of their most precious and loved models. What brought The Mechanists and The Rake together once more are two new bracelets that Hedi has designed. The first of which is in partnership with 24hour Le Mans, which is easily the most adrenaline-fuelled (and, about a century ago, intoxicant-fuelled thanks to the Bentley Boys’ antics) car meeting in the world. Handmade in England, the 24hour Le Mans edition bracelets feature an enamel French flag and celebrate almost 100 years of motorsport, channeling decades of history and emotion from the world’s biggest race. The second bracelet is named the Bloody Heroes. It serves to celebrate the legends motorsport whose exploits have created long-lasting, cherished memories for all those in attendance. It is a tribute to all the men and women who risked - and sometimes lost - their lives pushing the limit of their machines around the famed racetrack and, nodding to the past, each bracelet features a personalised engraving of the wearer’s blood type. A portion of the proceeds from each sale will be donated to charity to support blood cancer research, a cause that’s close to Hedi’s heart. For this shoot, styled by our very own Veronica Perez, there was no better car to use than a Le Mans-winning Aston Martin DBR2 Recreation. Slightly larger than its predecessor, the DBR1, some would argue that it’s the most beautiful race car of all time. In the 1980s, Tempero Specialist Body Constructors were commissioned to build a recreation of the two-seater DBR2 using an Aston Martin chassis, feline and running gear. Keeping true to the period, it’s in a beautiful sage racing green. The second model we were granted permission to shoot with is equally special, a 1960 Ferrari 250 GT Coupe Pininfarina. Perfectly balanced, it marked the point where Pininfarina became the sole designer of the Ferrari series. A fine long-distance tourer, it’s still in its original manufactured colour of Rosso Rubino. Both of these stunning feats of automotive design are up for sale at Sports Classics, and we invite you to head to the showroom and have a snoop around. If they’re not for your liking, not only is that questionable, but there are several more rare and pristine motors on show.